This wedding was so special to me because Andrea came to me with an awesome seating chart idea and I was so happy to make her vision come to life! 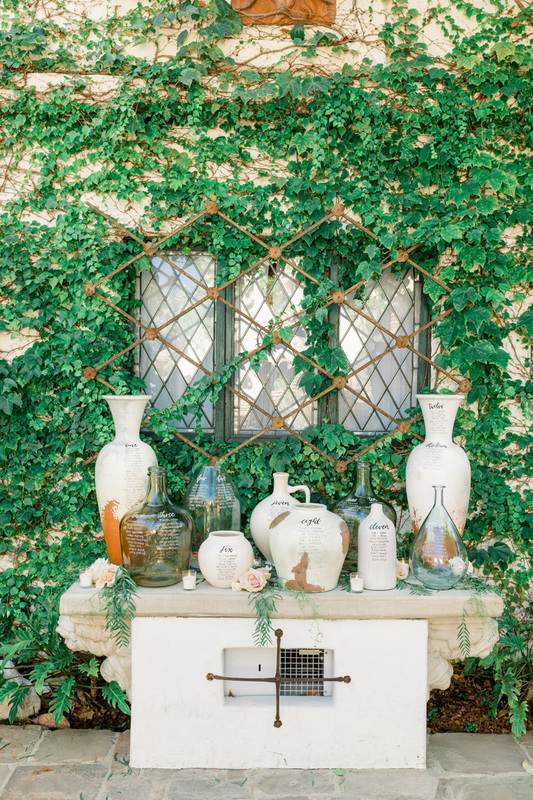 She had collected a variety of vases, vessels and pots from different places and had me write the table assignments on those to create a beautiful display for her wedding at The Villa San Juan Capistrano. I also did pointed pen calligraphy for her place cards, table numbers and some signage on textured, handmade Silk and Willow paper. I absolutely loved her ethereal and romantic vibes resembling Tuscany, not to mention - she looked stunning! Natalie Schutt Photography captured every detail perfectly and I am just obsessed with how everything came together. The gorgeous florals by Seven Stems is the perfect touch and I hope you enjoy these photos! Wishing Andrea + Jordan the best life together! !